As luck would have it, I won third place! Not the champion but still a winner. They gave me a certificate and ₱25,000 cash prize. Sadly, I wasn't able to attend the awarding ceremony. 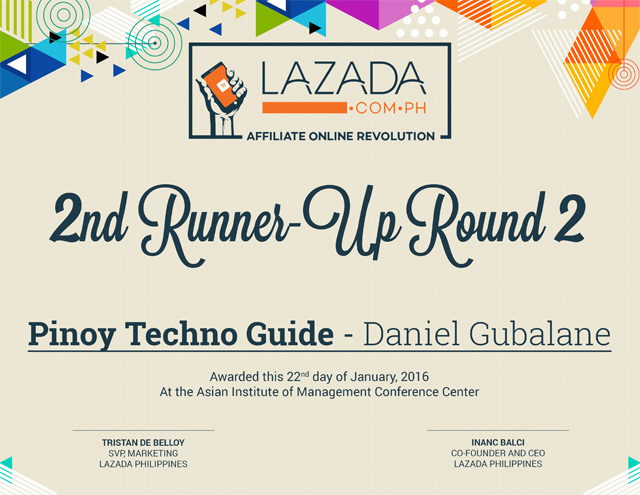 The biggest source of my affiliate sales came from Pinoy Techno Guide. There’s a standard banner advertisement on top of that tech blog and deeplinks are incorporated in the articles. Some sales also came from my Facebook page but it’s negligible. I might have won the second of even first place if I exerted more effort in promoting affiliate links on Facebook. However, I think it’s annoying to some people. Personally, I don’t like seeing affiliate links on my Feed and Facebook Groups. No doubt, I’ll still be participating on Lazada’s next affiliate contest. I still have to improve my strategy in mobile and find a way to use social media without being annoying to my followers. If you're not yet a Lazada Affiliate, register here. Hi Daniel! First of all congrats for winning this one. I'm also planning to be part of lazada affiliate to add on my monetization. I have question though, does lazada cookie base also like amazon? Let's say I clicked to your lazada affiliate link but I didn't buy the product, but I bought a different one, is it possible that i will still get a commision on that item? Thanks, hope I will get a response from you soon. Yes, you will still receive a commission. The cookie lasts for 30 days. Hi Daniel, if the shopper is using an iPad or mobile device will you still getba commission?